Being an intern with River Source this summer has been a very great learning experience. I was given the opportunity to work with so many fascinating individuals who were just as interested and passionate about natural resources as I am. I was able to gain a lot of knowledge from these individuals and even build long lasting work relationships with them. I was also able to gain a strong background in field work by assisting in various projects located throughout reservations and communities in central New Mexico. I have gained so much knowledge and an even better understanding of what I want to study in college and what type of career I want to pursue thanks to this internship. 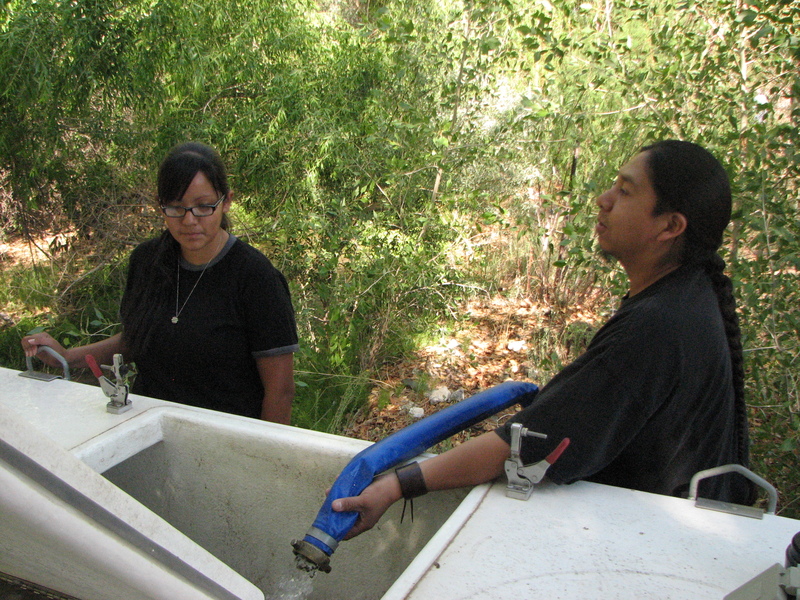 The trip that most prepared me for working as an intern with River Source was our Santa Ana Pueblo Field Day. River Source had collaborated with the Santa Ana Pueblo Department of Natural Resources to have a Water Quality and Benthic Macro-invertebrate training for the youth of the Santa Ana Summer Language Program. It was the first training we ever participated in with River Source and also the first time we utilized the water quality equipment in the field. We engaged in all of the stations with the youth that were provided at the site on the Rio Grande River, which included a Water Quality station, a Benthic Macro-invertebrate station, and a Keres station where the elders taught the students the Keres names of animals, bugs, and plants. We were able to teach the youth what each water quality instrument was, how it functioned, and how to properly utilize it to gather data. Being able to teach and work with the youth of Santa Ana Pueblo was the most benefitting experience for me because I was able to better understand the function and use of each water quality instrument, develop my communication skills, and gain more experience with working with youth and adults. It was such a fun day and it gave me a great feeling knowing that I was able to pass down knowledge onto the younger generation and hopefully even inspire some of them to enter the field of natural resources, as well. Since our main focus for the internship was the restoration of the lower Santa Fe River in the Cochiti Reservation, we worked alongside with the Cochiti Pueblo Department of Natural Resources and Conservation (DNRC) to establish tasks that we could meet during our time as interns. Kai-T Blue-Sky, of Cochiti Pueblo, was our supervisor at the Cochiti DNRC and was by far the most helpful person we would work with. He assisted us in all of our tasks, guided us during all of our field work, and provided us with helpful information regarding our restoration efforts. By working with Kai-T, we were able to gain more knowledge about the important work staff members in Natural Resources departments do not only in the field, but in the office. We were able to observe Kai-T perform a Biological Assessment for the Santa Clara Department of Natural Resources as they tried to establish a thinning project on lands west of Puye Cliffs. We were able to gain a thorough background in all the current projects he has to manage and track within the DNRC at Cochiti Pueblo. By shadowing Kai-T as he performed his duties, we observed how Natural Resources departments function, how to communicate efficiently and effectively with various people on what needs to be accomplished in order to move forward on projects, and, most importantly, how collaboration with other tribes Natural Resources departments is beneficial for both present and future efforts/projects. We were able to gain so much knowledge and field experience by working with Kai-T; it was a great opportunity being able to assist him in his restoration efforts. One of the most important skills I have gained by working in this internship is learning how to create a restoration plan. A restoration plan identifies a degraded habitat and then outlines specific methods, strategies, and techniques that should be use to return the habitat to a healthy, self-sustaining ecosystem with natural function and native species. 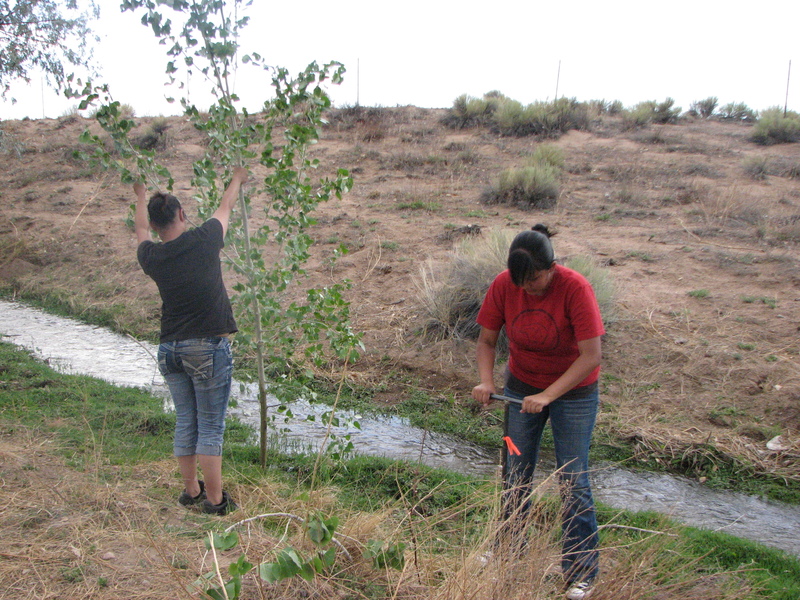 Our plan, titled the Cochiti Pueblo – Santa Fe River Restoration Plan, outlines specific restoration efforts that need to be started or continued. It provides a detailed planting plan and seed mixes. We created our plan to focus on efforts that will need little to no funding, but it still includes a chart with general cost of labor from another funded restoration plan done on the Jordan River in Utah. Our restoration plan provides integrated invasive species treatment information, detailed monitoring and maintenance strategies, and recommended types of access to the Santa Fe River. Although our restoration plan is specific to the lower Santa Fe River within Cochiti Reservation, the plan can be utilized as a template for any future restoration efforts and may even be directly implement in areas with similar conditions to those at the Santa Fe River. It was a very challenging task trying to complete the restoration plan since none of us interns had ever done one, but it was a very rewarding experience being able to complete the plan and have it seen by the Cochiti Pueblo DNRC as a valuable resource for future restoration efforts. This internship has been very rewarding to me not only as a student entering Natural Resources, but also as an individual excited to explore the world. It has opened my eyes to a very vast and complicated field, but it is a field that I know I want to be a part of thanks to this internship. I am very confident that this experience has given me a great exposure to natural resources and that I can apply this newly gained knowledge to any future environmental careers I may pursue. Thank you, Rich and Carlos, for this wonderful opportunity!